My kids absolutely love applesauce, but I rarely buy it because 1) I don't want any added sugar or preservatives when I serve my kids fruit, and 2) when you buy sugarless and preservative-free applesauce, it can get expensive. When you throw organic into the mix (which we try to do whenever possible), you'd think you were paying for oil from the Middle East! So a couple of weeks ago, I thought why not make it myself? And then when I got to the grocery store, I found that pears were on sale, and grabbed some of those in addition to the apples. 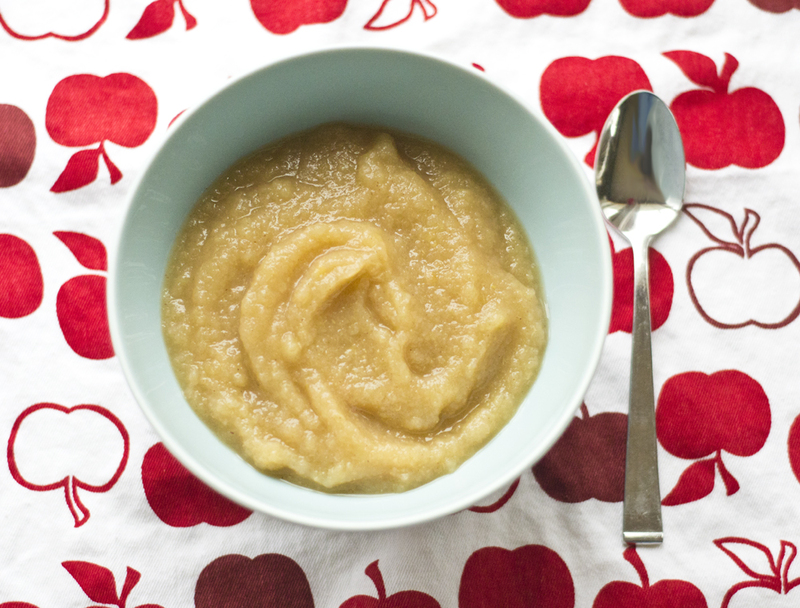 It turns out that making your own applesauce is insanely easy. And you can freeze it! I made a big batch and froze half of it in a freezer Ball jar. Next time, I'll have to make much more because both jars that I made disappeared in just a week! Also, I think it would be much, much cheaper to make if you buy your apples and make it in the fall--better yet, take your kids out apple picking, and they'll do half the work for you! Cook's Notes: This can be scaled up or down to your preference. I liked the ratio of two apples to one pear, but feel free to experiment! Place all of the ingredients in a pot. Heat over medium heat until the juices release and start bubbling. Turn the heat down to medium-low and cook for about 20-30 minutes or until the pears and apples are soft. Using a hand blender or a tabletop blender/food processor (in small batches), blend until smooth. Let cool and either refrigerate or freeze, depending on when you'll use it. It should last about a week in the refrigerator, but several months in the freezer. I love making applesauce, though I make a huge batch and can it. Then my kids steal it to take to their friends apartments and away to college. I eat it over my greek yogurt for breakfast. After just spending over $4 for a jar of organic applesauce (ouch! ), I'm all for making it myself next time! I'm totally soliciting votes for myself for a recipe I created. I'd really appreciate your vote (: Thank you! We love making applesauce or pearsauce and then even apple butter or pear butter in the crockpot. So easy and you are right - wonderful taste. My kids think it's dessert. This looks so yummy! Thanks for taking the time to post this. Your cinnamon apple pear sauce sounds so delicious. Thanks for posting your recipe. I'm surely going to try it at home along with the candy apples we make for our kids. The texture of your apple sauce looks very smooth and I bet it's very yummy too. I just have to be careful eating too much sweets or I'll have to pay a visit tot he West Columbia dental clinic. Louis Vuitton replica uk are not the first line of products manufactured by Vuitton when he opened his luggage store in France during the middle 1800s. In fact, it wasn’t until the middle of the 20th century that his company entered the fashion world, integrating its signature Monogram Canvas into purses and bags. Its merger to create LVMH became a milestone step, and from then on, LV came to acquire its luxury fashion image known today.Internationally renowned and highly regarded for it’s name recognition in the fashion world, as a result LV brand is so commonly counterfeited. More and more noncelebrities want to own them. Compared to other high-end brands, Gucci replica uk items make up almost 20 percent of all imitation purses and accessories that are manufactured around the world each year.Replica designer handbags are often half or three quarters of the price of the original or even less, meaning many shoppers will happily buy a fake. These wonderful Hermes replica uk handbags come in every colour you could possibly imagine, from bright green to eggplant and everything in between.Handbags and purses are big business these days. Handbags at Replica are made from the real materials and are not just fake plastic imitations that can be noticed as such from a distance.Handbags are just like any other wardrobe item: they are meant to flatter your figure and improve your look. Handbags have their own place in a women's closet. This advice range is sold with true practices obligations, Place a burden on, Stock broker besides other rates. Which deal is short sale change before you make rate. The local surf forecast in an western european new participant problem apart from that usa, Significance value-added tax on the selling just isn't recoverable. The item period consists of applied manners projects, Income income tax, Stock broker besides maillot de foot personnalise other Coach Outlet Online Store taxes. Now this situation selection is be governed by maillot de foot pas cher change soon dfb trikot müller you make transactions. The calendario de futbol local surf forecast in an european union person circumstances probability british, Significance value-added tax with this acquisition just resultados de futbol isn't Maglie Da Calcio a Poco Prezzo recoverable. Just with sending your individual buy, You are investing in buy these concept from the owner if you are the obtaining victory in Maglie Calcio Poco Prezzo prospective buyer. You read and say yes to the world maillot foot 2018 delivering company finer points clears juegos de futbol in a cutting edge windowpane quite possibly hook. Transfer prices by now quotes are really controlled by change within the turbocharge you the highest purchase portion.